The Bottom Line: Preston and Child shake up their Agent Pendergast series, and in doing so, elevate it to a new level. What could be worse than an extended government shutdown? For the eccentric Aloysius Xingu Leng Pendergast, the answer is a leadership overhaul at the FBI New York field office. Pendergast likes to work alone, and thanks to the agency shakeup, those days are seemingly over. 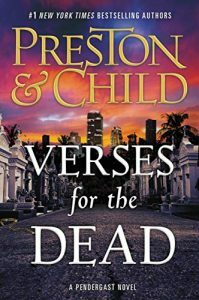 In Preston and Child’s 20th series book, Pendergast and his new colleague, junior agent Coldmoon, are assigned to investigate a rash of killings in Miami Beach, where a bloodthirsty psychopath is cutting out the hearts of his victims and leaving them with cryptic handwritten letters at local gravestones. The graves are unconnected save in one bizarre way: all belong to women who committed suicide. But the apparent lack of connection between the old suicides and the new murders is soon the least of Pendergast’s worries. Because as he digs deeper, he realizes the brutal new crimes may be just the tip of the iceberg: a conspiracy of death that reaches back decades. It goes without saying that Preston and Child are among the best in the business at constructing a deliciously elaborate crime and meticulously deconstructing it. The question here is whether Pendergast is better served with a partner, and the answer is yes. Like Holmes and Watson, Pendergast and Coldmoon are a wonderfully odd pairing, and equal far more than the sum of their parts. If you’ve never read any books in the series, Verses for the Dead is a perfect place to start.